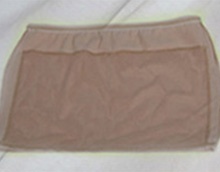 Ostomy Belt band fabric black or beige style 411extensible, light, flexible and soft. Specialy made for Lady or Men with wide hips. The waist and hip size is made by a computerized scale for superior comfort below the waist, wider hips for better comfort especially for people with larger hips. The support pocket has been sewn in the interior, in order to eliminate the need of any fastener to the ostomy belt. Product benefits Ostomate can have active lives if they wear the ostomy belt, as it hold the ostomy pouch in place and prevents it from detaching during physical activities and during the night. Ostomy belt is available in black and beige, has a universal pocket whether your ostomy is on your right or left side. It will suit you perfectly! Manufactured according to industry standards out of nylon (80%) and Spandex (20%); this amalgam produces a breathable fabric. Ostomy belt Made in Canada (patented) superior quality product appropriate continuous production monitored.